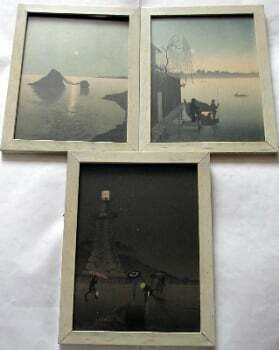 East Asian Art, paintings & works from China, Japan, Thailand et al @ Ranchi Art & Antiquarian Books. Bird in Japanese Maple tree, woodblock on silk, signed and seal, unknown. c1920. 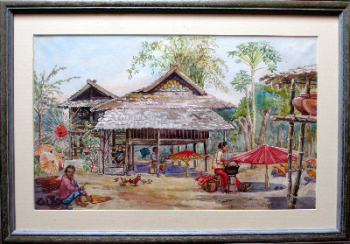 Chiang Mai, Thailand, Umbrella Makers' Village, watercolour on paper, signed Anne Dorrien Smith, c1950. SOLD. Chinese Geese, mixed media on silk, signed Ohara Shoson Koson. Original frame. c1912. 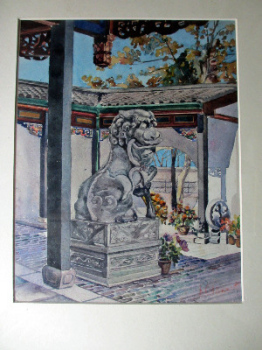 East Asian Shishi, Temple Guardian Lion icon, watercolour on paper, signed A. Clemet. c1900. 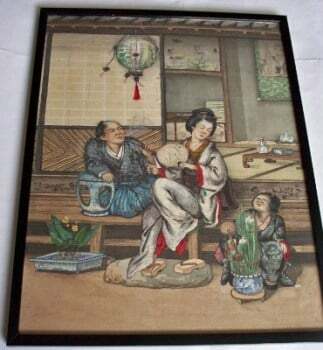 Family life, Japanese mixed media on silk. Late 19th/Early 20th C.
Female Farm Labourer, watercolour, signed T. Nakayama. c1930. SOLD 09.08.2014. 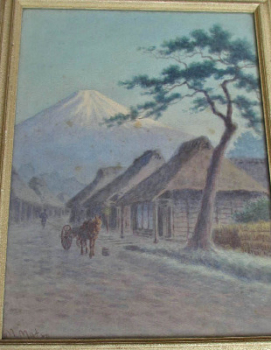 Fujiyama, village scene, signed by M. Matsu, c1930. Original frame. 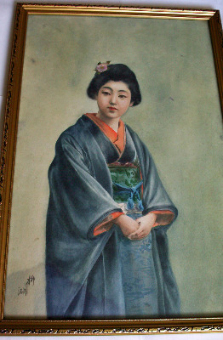 Geisha girl portrait, signed, c1930. 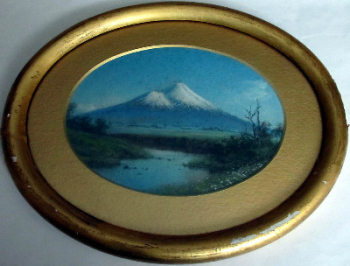 SOLD 25.01.2014. Geisha with Fujiyama, watercolour and gouache on silk. c1960. Framed and glazed. SOLD 12.09.2014. Greek flagged cargo ship "Polaris", oil on canvas, signed G. Yamataka 1958. Framed. SOLD 09.08.2017. 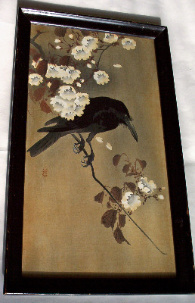 Japan Black crow on Cherry Branch, mixed media on silk, signed Ohara Koson late 19th/early 20th Century. c1910. Japanese Ferry landscape in Shizu-ura district, oil on board, titled and signed Shou-yama, c1955. Framed. 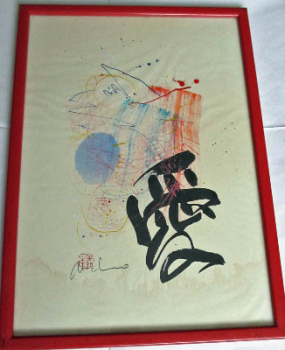 Love, Blue Light, Yokohama, mixed media on paper, signed Michio, c1975. Nihonbashi in Edo, Japan, Ukiyo-e woodblock print, Eisen Keisai, 1852, from The 53 Stations of the Tokaido, gravure print, c1960. Framed. Portrait of an Uzbekistani woman, gouache on paper, unsigned. c1950. Original frame.